During an emergency, when the water supply has become undrinkable, land-based filtration units can be lifesaving. Our systems are completely self-contained and portable. 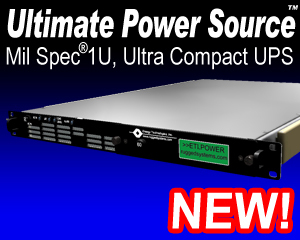 They can operate independent of the grid when other portable ETI power products are available. Power can be supplied by solar panels, wind generator, or by an auxiliary generator. These small plants come in several configurations and can produce from many liters of pure potable water per day depending on the water source. For seawater or brackish water, reverse osmosis is employed, and for contaminated fresh water, ultra-filtration membranes purify the water. The modular construction facilitates ease of handling, maintenance, and placement. One unit could sustain many of families during a disaster. It can also provide enough excess energy for emergency disaster officials to power refrigeration for emergency medical supplies, keep a laptop online, or ensure that crisis communications equipment remains operational. 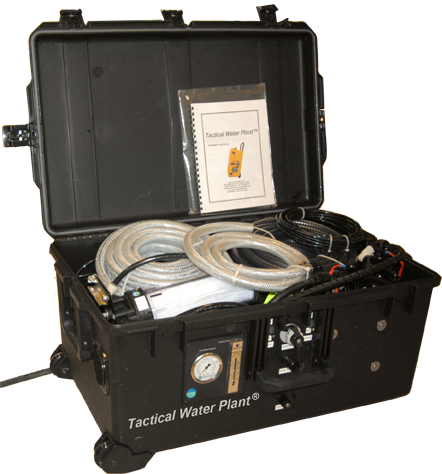 ETI's NEW Tactical Water Plant is available with optional Solar Panels mounted into its case.